And here I'd always considered La Chinoise the only French-language film that used both borrowed Chinese imagery and lofty theory to mount a critique of capitalism. It turns out that six years after Jean-Luc Godard made that movie, Sinologist, Situationist, and filmmaker René Viénet came out with the next important volume in that fascinating minor tradition, La Dialectique Peut-Elle Casser Des Briques? (Can Dialectics Break Bricks? 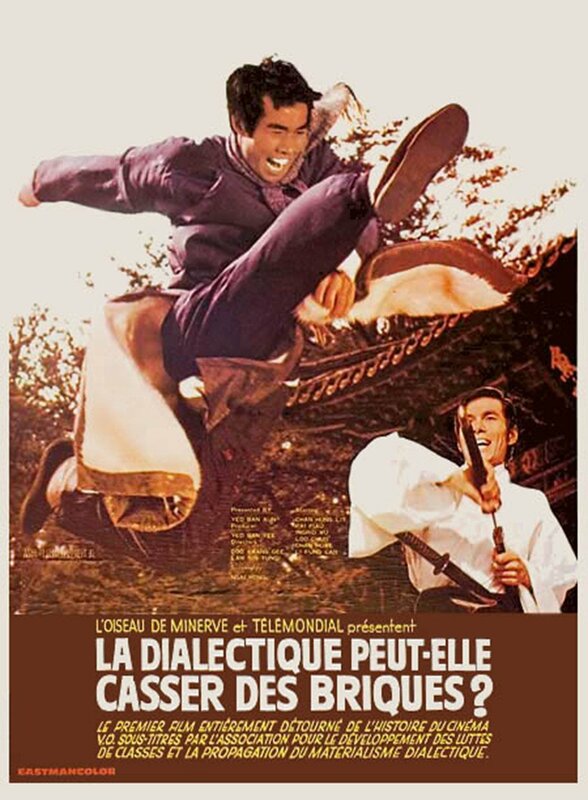 ), an entire Hong Kong martial-arts picture entirely repurposed into, as Dangerous Minds' Richard Metzger puts it, "a critique of class conflicts, bureaucratic socialism, the failures of the French Communist Party, Maoism, cultural hegemony, sexual equality and the way movies prop up Capitalist ideology." Using as its visual material 1972's Crush, Tu Guangqi's hand-to-hand-combat-intensive tale of Korean rebellion against Japanese imperialism, the film followed the model of Woody Allen’s What’s Up, Tiger Lily? "which re-dubbed humorous dialogue over a Japanese spy movie to make the plot about a recipe for egg salad [...] but here the cinematic Situationist provocateur is less out for laughs (although there are plenty of them) and more about the political subversion." This intersection of lo-fi chop-socky action with high-flown revolutionary jargon and academic name-dropping ("My Foucaults! My Lacans! And if that's not enough, I'll even send my structuralists") has for decades struck its viewers as sublimely ridiculous. But do the images and the dialogues really clash as totally as they would seem to? "Like many Hong Kong productions of the early seventies," writes Luke White at Kung Fu with Braudel, "the scenario of the original film is clearly one in which colonial exploitation and resistance are at issue. Set in Korea under the Japanese occupation that lasted much of the first half of the twentieth century, the heroes (those turned by Viénet into 'the Proletarians') are the members of a martial arts school who start to resist the colonial violence of the militaristic Japanese forces. However potentially conservative the nationalistic dimension of its narrative, this is also a work about struggle and liberation from tyranny in some of its most typically modern forms." In its multiplicity of possible interpretations, La Dialectique Peut-Elle Casser Des Briques? joins the ranks of all the most interesting works of art — and it certainly makes for a refreshing break from actually reading your Foucaults, your Lacans, and your structuralists.